Norman Rockwell (1894-1978), “United Nations,” 1953. Study for an unfinished illustration. Pencil and charcoal on paper. Norman Rockwell Museum Collections. Beyond the legendary status that he had achieved during his lifetime, artist Norman Rockwell (1894-1978) was a masterful visual communicator with a deeply held belief in the imperative of peace, prosperity and basic human rights for all the people of the world. His compassionate images of family, community, and the challenging issues facing a rapidly changing world became a defining national influence, reaching viewers by the millions in the most popular periodicals of his day. In 1952, at the height of the Cold War and two years into the Korean War, Rockwell conceived an image of the United Nations as the world’s hope for the future. His appreciation for the newly formed organization and its mission inspired a complex work portraying members of the Security Council and 65 people representing the nations of the world. Golden Rule, which appeared on the cover of The Saturday Evening Post and later as a large mosaic at the United Nations. We the Peoples: Norman Rockwell’s United Nations will be on view at the UN’s Visitors Center in New York City, from June 20 through September 15, 2015. “Norman Rockwell was a keen observer of people and believed that every person mattered. As he matured as an artist, his subject matter frequently addressed issues of social change and our common humanity,” says Norman Rockwell Museum Director/CEO Laurie Norton Moffatt. “We are honored to be partnering with the United Nations, at the invitation of Deputy Secretary-General Jan Eliasson, for this special exhibition commemorating the 70th anniversary of the organization’s peacekeeping efforts. Eliasson believes that Norman Rockwell’s artwork captures the humanitarian aims of the United Nations and embodies ideals for all people. Indeed, his interest in portraying international figures, America’s civil rights movement, the early work of the Peace Corps and the United Nations, and The Four Freedoms (soon to celebrate their own 75th anniversary), informed and helped shape civil society in America. 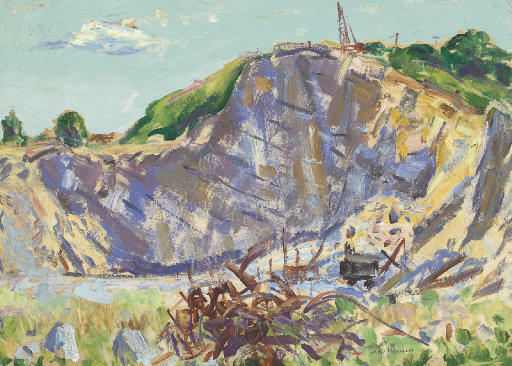 We are proud to be able to share this inspiring and heartfelt display of his work, from our permanent collection. Organized by Norman Rockwell Museum with support from the United Nations Foundation, We the Peoples features 33 original artworks, and marks the first showing the artist’s rare 1953 drawing, United Nations, outside of Stockbridge. Along with 1961’s Golden Rule painting, the exhibition will feature idea sketches, color studies, and notes for both artworks. A selection of reference photos taken by the artist at the UN, featuring several of its ambassadors and members of its Security Council, will also be displayed, along with photographs of local models, taken in his Arlington, Vermont studio in 1952, as reference for the artwork. Other highlights from the exhibition include a series of travel paintings and drawings created by Norman Rockwell in the early 1960s, featuring spontaneous oil portraits of citizens from India and Russia; 1955 drawings from the artist’s sketchbook reflect his observations during a worldwide trip for Pan American Airlines’ advertising campaign; and two paintings of the Peace Corps in India, created for Look magazine in 1966, showcase Rockwell’s idealism and hopeful outlook for the future; digital reproductions of some of his most iconic Civil Rights era paintings also will be included. Additional archival documents and video will support the exhibition. Also on display, the towering glass mosaic of Rockwell’s Golden Rule was presented to the United Nations in 1985 as a 40th anniversary gift on behalf of the United States by then First Lady Nancy Reagan, made possible by the Thanks-Giving Square Foundation. In 2014, the newly restored mosaic was rededicated by the Permanent Mission of the United States by Assistant Deputy Secretary General Jan Eliasson, whose vision was the impetus for this exhibition. Martin Johnson Heade (originally Heed) was born in Lumberville, in Bucks County, Pennsylvania on August 11, 1819. He received his earliest artistic training from the painter Edward Hicks (1780-1849) and perhaps had additional instruction from Hicks' younger cousin Thomas, a portrait painter. The influence of these two artists is evident in Heade's earliest works, which were most often portraits painted in a rather stiff and unsophisticated manner. Heade traveled abroad around 1838 (the precise date of this first European trip is uncertain), and settled in Rome for two years. He made his professional debut in 1841 when his Portrait of a Little Girl (present location unknown) was accepted for exhibition at the Pennsylvania Academy of the Fine Arts in Philadelphia. In 1843 his Portrait of a Young Lady (present location unknown) was shown at New York's National Academy of Design. Following a second trip to Europe in 1848 Heade attained a somewhat greater artistic sophistication and began to exhibit more regularly. He moved frequently in the late 1840s and early 1850s, establishing a pattern of itinerancy that would persist throughout his life. Heade gradually concentrated less and less on portrait painting, and by the mid-1850s was starting to experiment with landscape painting. In 1859 he settled in New York, where he met Frederic Edwin Church, who became one of his few close friends in the American art world. 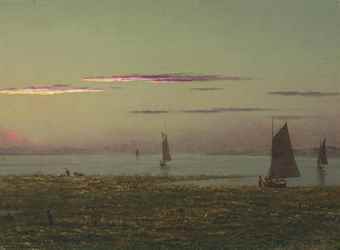 Heade was drawn to coastal areas and began to specialize in seascapes and views of salt marshes; soon he was receiving praise for his ability to capture changing effects of light, atmosphere, and meteorological conditions. In the late 1850s and early 1860s he began to experiment with still-life painting, an interest he would maintain for the rest of his career. He continued to travel in the eastern United States and then, in 1863, made the first of three trips to South America. Church had already been to the tropics twice, and his large-scale paintings of dramatic South American scenes had won him widespread fame and critical approval. Although Church encouraged his friend to seek out equally spectacular scenery for his own paintings, Heade was generally interested in more intimate and less dramatic views. 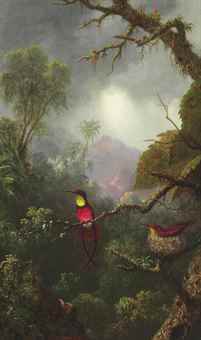 While in Brazil in 1863 he undertook a series of small pictures called The Gems of Brazil (c. 1863-1864, Manoogian collection), showing brightly colored hummingbirds in landscape settings. He hoped to use these images in an elaborate illustrated book he planned to write about the tiny birds, but the project was never completed. 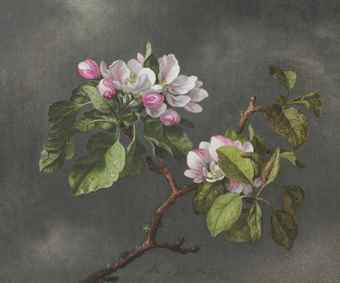 Nevertheless, he maintained his interest in the subject and in the 1870s began to paint pictures combining hummingbirds with orchids and other flowers in natural settings. 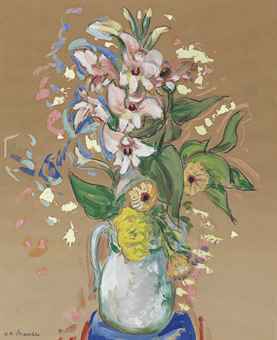 During these years he continued to paint marsh scenes, seascapes, still lifes, and the occasional tropical landscape. In later life Heade's wanderings took him to various spots, including British Columbia and California. Never fully accepted by the New York art establishment--he was, for instance, denied membership in the Century Association and was never elected an associate of the National Academy of Design--Heade eventually settled in Saint Augustine, Florida, in 1883. He was married that same year and at last enjoyed a reasonably stable domestic and professional existence. He also formed the first productive relationship of his career with a patron, the wealthy oil and railroad magnate Henry Morrison Flagler, who would commission and purchase several dozen pictures over the next decade. Heade continued to paint subjects that he had previously specialized in, such as orchids and hummingbirds, but he now also turned his attention to Florida marsh and swamp scenes and still lifes of cut magnolia leaves and flowers. Heade and his work were largely forgotten by the time of his death on in St. Augustine on September 4, 1904, and it was only with the general revival of interest in American art in the 1940s that attention was once again turned to him and his reputation restored. MARTIN JOHNSON HEADE (American, 1819-1904). Sunset over the Marsh, c. 1876-. 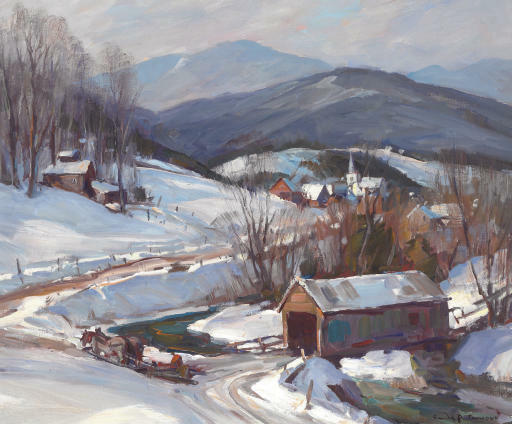 Emile A. Gruppe Gallery, Inc. These Emile A. Gruppe paintings are currently for sale. Please inquire for prices. Alfred Maurer was one of the first American painters to reflect the influence of European modernism in his painting. Born in New York, Maurer studied in 1884 at the National Academy of Design, New York, where he became recognized as an accomplished painter of portraits inspired by those of James A. M. Whistler and American impressionist William Merritt Chase. From 1897–1914 Maurer lived in Paris where he became acquainted with fellow Americans Arthur Dove and Gertrude and Leo Stein. 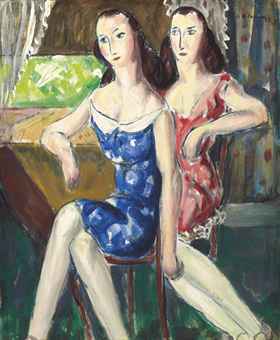 It was in the Stein’s salon, a well-known meeting place for Americans and modern French artists, that Maurer met Henri Matisse. The intense color and expressive freedom of Matisse’s fauvist paintings forced Maurer to reexamine the fundamentals of his art. 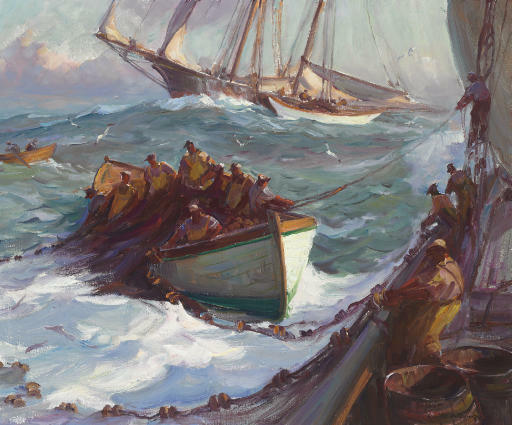 Maurer’s painting between 1905 and 1914 became the work of an artist whose gift for lyric expression had been released for the first time. 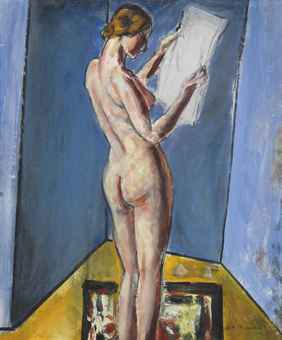 Using the bold colors of the fauve palette and the dark, rough outlines of pre-cubist art, Maurer attacked his canvases with renewed vigor. 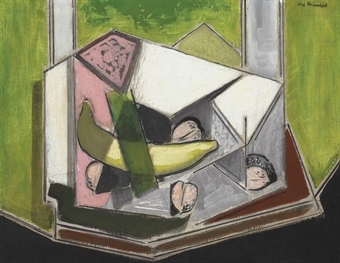 Widely respected by his avant-garde contemporaries, Maurer exhibited in 1909 at Alfred Stieglitz’s Gallery 291 in New York, in the 1913 New York Armory Show, and was an associate member of the modernist Salon d’Automne in Paris.